In the last two weeks, both India and China are at loggerheads when the former decided to encroach into the Chinese side of the border in the Doklam. The incursion is related to the OBOR CPEC projects in Pakistan, which has been India’s geopolitical enemy since the death of Mahatma Gandhi – a legacy of UK’s highly effective divide and conquer strategy in the region, which saw the deaths of millions from both sides. Here’s a quick summary of what has transpired at the Xi-Modi meeting on the sidelines of the just concluded BRICS Summit 2017 in Xiamen, China. BRICS Summit 2017: During the bilateral talks, Chinese President Xi Jinping told Prime Minister Narendra Modi that healthy, stable bilateral ties are in line with the interests of both countries, according to Chinese state media Xinhua. China’s Xi called for putting ties with India on the “right track” and said the two countries should pursue “healthy, stable bilateral ties”, reported the Chinese state media. The two leaders reaffirmed their understanding in June at Kazakhstan’s Astana “to not allow differences to become disputes,” Mr Jaishankar told reporters. They also agreed that it is in the interest of both India and China to have good relations. “The discussions were very constructive on where the relationship should be going and will be going,” Mr Jaishankar said, describing the meeting as “forward-looking”. He said both sides decided to have closer communication between the defence and security personnel, so that there is no repeat of incidents in the recent past, an apparent reference to the Doklam standoff. Mr Xi reportedly told PM Modi that China was prepared to work with India to seek guidance from the five principles of the Panchsheel Treaty signed between India and China in 1954. PM Modi and President Xi had met informally at the G20 summit in Germany in July, but their last bilateral talks were in June, when they met in Astana during the Shanghai Cooperation Organisation meet. That meeting took place amid growing differences between the two nations over a range of issues including the China-Pakistan Economic Corridor and China’s opposition to India’s efforts to enter the Nuclear Suppliers Group. Last Monday, the government announced that New Delhi and Beijing had decided on “expeditious disengagement” of their border troops in the Doklam area. India scored a significant point on Monday as the BRICS nations, for the first time, named Pakistan-based groups like Lashkar-e-Taiba, Jaish-e-Mohammed and the Haqqani network in a strongly-worded declaration condemning terror. India’s Prime Minister Modi is obviously having a hard time accepting the Chinese wisdom of prosperity for all, and not just the BRICS member countries. He even showed the world how he passionately embraced the butcher of the Middle East. 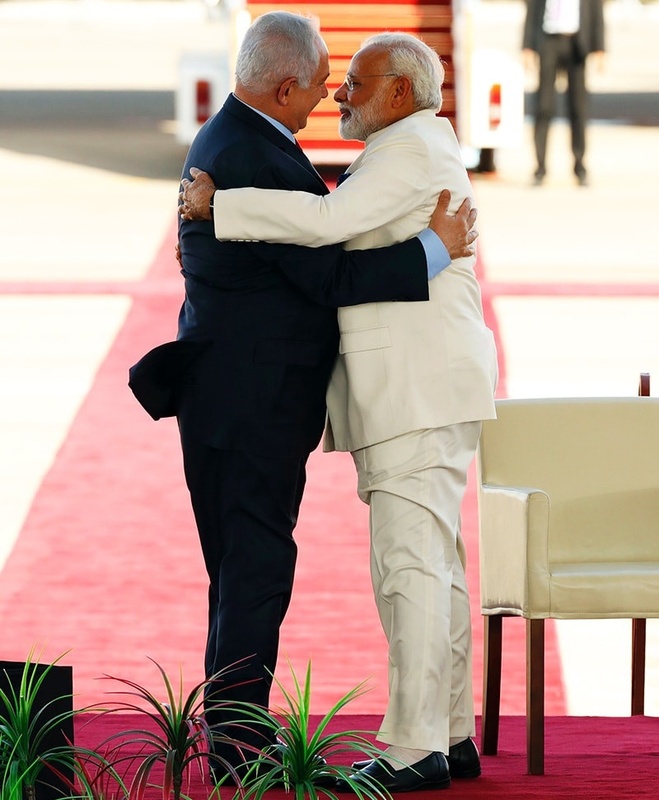 Israeli Prime Minister Benjamin Netanyahu (L) greets his Indian counterpart Narendra Modi (R) during an official ceremoney at Ben-Gurion International airport near Tel Aviv on July 4, 2017. Good to hear, True evolving diplomacy, Those Jew controlled Brits, plan of division is falling apart, Thankyou BRICS! Modi and nuttyahhu were hugging alongside the beach like two homos the other week pledging each other’s national resources to each other. I know that israel is trying to make india their main sugar daddy now that their welfare gravy train is likely coming to an end from usa and europe (and already has to some extent, especially publically with the rising public awareness of zionism and jewish tactics)… And indians, being the secretly vengeaful people that they are (including modi), are buying into the jewish propaganda tactics that bolsters their EGO at the expense of others (ie “us indians are so much better than the chinese; were going to reject their products bc were so much better than they are, and screw pakistan too! Indian labor is the best!”. Also, india pakistsan and chinas HUGE populations make them easy pickings for a war against each other: millions could die serving israel’s objectives and noone would know or care bc itd only be a fraction of the population and theyd just breed another 10 to 1 anyway.